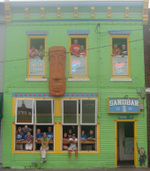 Sandbar Ottawa Celebrates Five Years of Business - The Sandbar...Home of the Indoor Hurricane! Last Friday night, our second Sandbar location down the road in Ottawa celebrated it's fifth year of business. Several people at the party commented that it didn't seem like five years had passed already. To me, it seems like it's been open a lot longer. Five years ago, shortly after it opened, our Ottawa location played host to part of the Sandbar's fifteen year anniversary celebration. We rented a bus, took reservations, and road-tripped to Baldwin City for dinner at The Lodge (another one of Peach and Ted's ventures, or should I say ad-ventures! ), and then on to Ottawa so everyone could check out the brand-new Sandbar. That night seems like ages ago. Friday's party gave us another opportunity to use the fabulous stage that Dave & company built for our downtown Lawrence block party. It was parked out by the sand volleyball courts, and the night was perfect (again!) for an outdoor party. Our friend Frankie Diamond took the stage at 7 pm, followed by the Ottawa band Big Deal at 9 pm. Frankie plays at the Ottawa Sandbar on a regular basis, so make sure to check him out another time if you missed this party. If you're really nice, he might even dedicate a song to you! There might not have been as big of a crowd for this party as there was in Lawrence, but it was still a lot of fun. Several friends from Lawrence made the trip, and there were lots of Ottawa Sandbar regulars there. Peach, Coleen, and Dave took advantage of one of the band's breaks to hop up on the ship's back balcony and perform our favorite Sandbar dancing tunes. I tried a new experiment with this party- my new friend Jenn introduced me to a website called Whrrl, which is basically a site where anyone with an account can create or join "stories." The stories can be updated on-the-go with pictures and notes, and they can also be integrated into Facebook and Twitter. Check out the Whrrl story from the Sandbar party here.